I am Mark Buckingham, one of the Physiotherapists at WPB, and on the 1st April 2019, I had surgery to my left shoulder. The shoulder had been troublesome for over a year, with pain on lifting and overhead work such as gym, throwing or hedge cutting. There was no incident or trauma, just a build up. Like all of us, I initially ignored it, then it became more painful, especially after gym work and was sore to put a shirt or coat on. Certain things at work, lifting legs and spinal manipulation, for example, was sore. Further, due to my thumbs showing the wear and tear of 25 years of hands-on physio, I had begun to use my elbow more and this was also sore. I tried to self treat during the middle of 2018 with self-mobilisation, shockwave and loading work. This had some improvement but each time I tried to use the shoulder a bit more, it was sore again. Towards the end of 2018, I decided that I had enough signs and symptoms that I should get a proper diagnosis. It is very hard to self diagnose – you simply cannot be objective enough. I discussed it with David Bradbrook, who is our shoulder guru, and we agreed to get it looked at by Mr Alistair Jepson who is both a colleague and a friend, but more importantly, an excellent shoulder consultant! The assessment in October showed impingement in the shoulder joint. This means that when the shoulder is put into various positions it pinches tendons and if these are inflamed or damaged it hurts! This was no surprise but as it was going on for 9 months at this point we decided it was reasonable to treat with an ultrasound-guided injection to see if we could calm the inflammation down whilst we re-doubled the efforts with the physio and rehabilitation. The injection was good – no pain at all and after a couple of days of it feeling somewhat fat and tender it calmed down well. 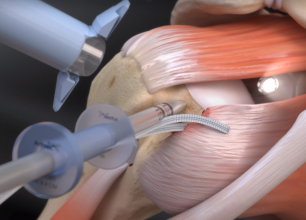 By the 3 weeks after the injection, there was very little pain to do the things like putting a coat on and I progressed with gym work to build up the strength in the rotator cuff. These involved external rotation and abduction exercises as well as a series of more classical shoulder and arm exercises building on strength in the tendon. By 5 weeks post-injection, there was no pain in the shoulder and I had the full range of motion and much-improved strength. I was lucky enough to travel to the Bahamas with my family at Christmas. I was able to be very active with swimming, running and work-outs with the extended family doing yoga and TRX routines. I also spent a lot of time in the sea with my boy Jack throwing a ball as well as snorkelling with my daughter Beth. I did not have any issues doing these things and I was pretty happy that the shoulder was settled. Unfortunately, on my return to work, it began to be sore again and by the middle of January, it was clear there was quite a lot of pain and tenderness in the joint, much like it was pre-injection. I cannot say there was any specific cause again – it just was sore to lift and put coats on as well as to test using the classic tests like Hawkins Kennedy, Empty can and other impingement tests. Frustrating. So we re-visited the treatment process, this time much more structured physio sessions with David as well as reduced gym loading. Mainly because there was significant pain I had pain on flexion and abduction as well as external rotation and pain on impingement tests and some pain on the tests for tendon tears, which was a new sign. Certainly an unwelcome one. Over 3 months we tried to get the tendon to settle and it did, bit by bit. The signs were better, the tests less tender and the strength improving slowly. However, it was slow and we both had the nagging doubt that there was possibly a tendon tear and likely to be some bone impingement. It is interesting that in recent years the research has been that most shoulder issues settle with physio and that some sub-acromial impingements can be avoided. I think that I was never quite convinced of this. David was more so in the early weeks. By the middle of April, I was given a bit of space. I was scheduled to be acting as an expert witness in a court case but this was adjourned until the Autumn. I had 3 weeks booked out of the diary for this in later April/early May so were I to need something more serious this was the time. So we decided that I would see Alistair again and have a further discussion. I saw Alistair and we decided that an MRI was appropriate. This showed that there was indeed some bone growing on the underside of the acromion and impinging in the rotator cuff. The MRI scan suggested that one of the tendons, supraspinatus, might be torn and damaged. However, the scan was inconclusive, as they often are with tendons like this. Alistair and I decided that given the now year long history, signs and symptoms, scan result and failure of a robust physiotherapy program that there was little choice but to operate as the bone growth was clearly stopping the rotator cuff from recovering. Plus, I had this period of opportunity where I was already booked out of work and further had some more time at what would be the 5th week after surgery, when I was again on a court date. Surgery was set for April 1st. april Fool’s day. What could go wrong…? The routine for the pre-op is a series of forms about current and past health. There is a blood pressure test; for me, an Electrocardiogram, given previous heart issues; a blood test; MRSA swabs or nose and groin; and a review of previous health and height and weight to see if you are under the red line of BMI 40. I was asked to arrive for 10.35 on the 1st and I was admitted and taken to the room by the nurse. We went through the process of check and re-check of the arm and the operation to be had. The Anaesthetist arrived and we discussed the options. I had opted with Alistair to have a nerve block and no general anaesthetic so that I could view the operation on the arthroscopic screen. This was mostly for professional interest reasons and also because Alistair and I knew that we would likely find some things not shown on the MRI and that it would be good for me to be part of the decision making process. This is not in any way because I did not trust Alistair to make the right call for me were I to be asleep, but as there is the option of a nerve block then why not? However, the Anaesthetist has to be happy with this and he was, under the proviso that was there to be an issue he would slip me under if necessary. Further, health wise it is often better for the patient to be asleep and the anaesthetist feels more comfortable that way. On a personal level, I was happy with this. I am not squeamish and like to be at least part of a clinical decision-making process. There is a view that watching your own surgery is a little macabre. Maybe, but I must say I found it fascinating and I certainly would do it again. The only part I did not enjoy was the effect that the nerve block had afterwards, but more of that in a bit. I had not eaten since before 12 midnight the night before (8.30 for me in fact0. I had drunk a lot of water the day before and no alcohol to ensure I was as hydrated as possible. I did not drink after 9 am on the 1st. I only then drank water. This was because should I undergo a full general anaesthetic I would not be at risk. The benefit of shoulder surgery is that I was allowed to keep cotton pants on. Overall more comfortable and I wore the brightest I had! They clashed somewhat with the tight calf length stocking I was also asked to put on to help prevent DVT. I ensured I had gone to the loo so that if the surgery took a while, which it did, then I wouldn’t need a pee! All metal rings and jewellery needed to come off. I only have my wedding ring which I left with my wife, Clare. It was odd to not have it on as I rarely ever take it off apart for medical stuff like this. The nurse came to get me at 12.30 to take me down to the operating theatre. I wore a dressing gown and slippers for comfort which I had been asked to bring some from home. Now, slippers I have, but I do not have a dressing gown. I ended up wearing my daughter’s silver and white starry number, a little too small and very female but, hey ho, I looked lovely. I was met by the Anaesthetist and nurse in the room beside the operating theatre. It is all very relaxed with the typical banter between everyone, mostly aimed at calming those who, understandably, might be a bit nervous. I was asked to lay on the trolley and get comfy as I wasn’t going to move for some time. We took the left arm out of the gown so as to make it easy access for later. You are covered with sheets and propped on pillows, not clinical at all. 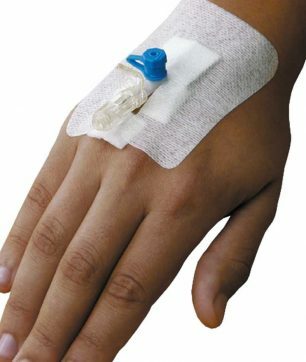 A cannula was placed in the back of my right hand. This is a portal with a valve to administer drugs and blood or fluids should it be needed. The classic phrase used by nurses and anaesthetists alike is, “you’ll feel a sharp scratch.” Let’s be honest here, it is not just a scratch. It is a sharp stab in the back of the hand and then a sharp pain as the needle and tube go into the hand. However, it is probably the most painful thing of the whole process, so if you have had blood taken it is little worse than that. 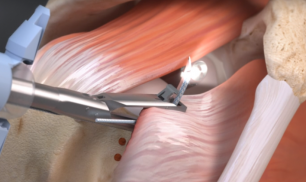 The nerve block is administered via a needle into the base of the neck and visualised on an ultrasound screen. As I was not having a general anaesthetic I was awake for this and watched as the anaesthetist worked with the nurse to place the needle and anaesthetic around the three nerves in the neck that travel down the arm. There was a surface spray on the skin to temporarily numb the skin for the injection. It was not painful. No more than the cannula that had been placed in the back of the hand just before. I, of course, found it interesting seeing the nerves and watching the needle infiltrate and inject the anaesthetic around the nerve. However, it is not obligatory to watch and typically it would be done once you are under a general anaesthetic. The effect is to numb the three main nerves that supply your arm and it renders your arm totally unresponsive. You cannot feel the skin or pressure inside. You cannot actively move the arm or hand. it is totally dead and floppy. The effect is not immediate and if you are awake for the surgical procedure you will not immediately notice it is useless but it kicks in over 5 – 10 minutes. It returns after the op over around 12-24 hours. My personal experience is that it was the worst part. Not because of the procedure but because it made my left arm lifeless. This I struggled with as despite your best efforts it just simply won’t do anything and you can’t feel anything. Thoughts like are this going to ever come back, with some associated panic, flood the brain. I am not prone to panic attacks but I had to calm myself down on a couple of occasions when I could really feel myself getting upset about the process. Yes, it did stop a lot of the immediate pain of surgery and of course, it allowed me to witness the surgical procedure. Further, it did come back by the next day, a lot by the same evening, but I did not like it at all and for me was the worst part, despite the obvious benefits! Would I have it again? Yes, because I now know what to expect and the benefits do outweigh the negatives. Once they were ready in the theatre I was wheeled. The theatre is just another surgical room full of various bits of kit, screens and trolleys with equipment on. There are 5-7 different people in there from theatre nurses to technicians to surgeons, anaesthetists and surgical assistants. If you see these on TV programs, they look very similar. The bed was wheeled under the lights and the anaesthetist checked the nerve block and asked me to have a face mask on. This was ostensibly to administer anaesthetic should I need it plus oxygen in the meantime. I suspect it was used to supply me with a little whiff of anaesthetic for ‘calming’ purposes throughout. I certainly felt quite sleepy at different points in the next hour or so and I was not particularly bored given the circumstances! A further set of checks regarding my name, date of birth, the procedure to be undertaken was gone through. I was obviously able to answer these questions myself but most patients are asleep so this is run through on their behalf by the nurse. As I was going to watch the procedure on the arthroscope screen a screen was set up for me to my right. My left arm was placed in a sheet with a hole in it. The hole fitted around the top of the shoulder and under the armpit. It was sticky and was to seal my arm from the rest of the body. To isolate it and protect me from what was happening. I was not able to see my left shoulder and the sheet was arranged so I was able to see the screen and the right side of the theatre but not the left. You can see from the picture the arrangement of the sheet and screen. Further, you can see the markings then made by Alistair on the arm to locate certain bony structures to help insert the scopes and implements in the right place. I had four incisions as seen in this image. The one at the back of the shoulder is not completely covered out by the nerve block and an injection of local anaesthetics was applied by Alistair. To be honest I could feel things going on around there and occasionally it was sore but not painful in any real sense. The bed I was laying on was arranged into a sort of reclined sitting position and the arm is pulled and manipulated by Alistair and his assistant to open the joint and allow space for the various implements to get inside. Once everyone was ready it was time to get on with it. The scope was initially inserted along with an instrument to move things around. The exploratory part of the op. 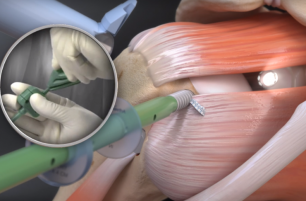 It was immediately clear that the bursa, the fluid-filled sack that sits under the acromion (top of the shoulder) over the humerus (arm bone) and helps the tendons inside and the joint to slide and glide, was inflamed and ragged. A likely source of a lot of the pain. There was a ridge of bone under the acromion, which was pointing down into the joint and the tendons on the top, causing impingement. This, as well as the bursa, had to go. So the first job was to trim and cut the ragged bursa out of the way. The is done by a nibbling and cutting jaw and sucked away bit by bit. The arm is filled with a lot of fluid, hence the size in the picture, to enable Alistair the room to move around. The best way I can describe the bursa was like a cartoon of cobwebs in a haunted house or Indiana Jones secret passage. Thick sheets of tissue. Once Alistair had trimmed and tidied the bursa he was able to get at the bone ridge which was nibbled away with a type of cylinder mower attachment. 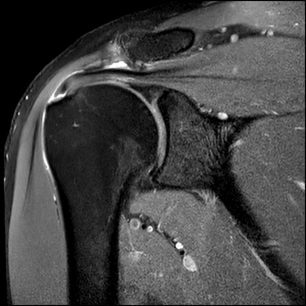 We had a good look at one of the rotator cuff tendons, supraspinatus, which is the most common to be damaged and was highlighted on the scan. However, it was found to be pretty good and no tears present. So we hoped this might be the lot, however, when Alistair had a further look around the joint he found that the infraspinatus was partially torn which was a pity because it would need to be repaired and this would add time to the rehabilitation process. To stitch the tendon up Alistair used a ‘scorpion’ which is a needle fired out of a probe which pokes a hole in the tendon. Through this hole, the suture material was passed and this was then secured into a ‘rawl’ plug which was inserted into the humerus. The rawl plug was inserted into a pilot hole made by hammering in a sharp metal point, or bradawl in carpentry terms. The plastic rawl plug is self-tapping into that hole and with a bit of pressure, it goes in. This is pain-free but you can feel the pressure being applied. Alistair also had to work hard to get the right angle because infraspinatus is not easy to get to. These pictures are of a subscapularis repair but the principle is the same. Once Alistair was happy and had checked everything else out the operation was over. It seemed to take no time at all, but it was for about an hour. The wounds were taped up with steristrips and a lot of bandages. The fluid tends to leak out of the joint afterwards so you make a bit of a mess. I was then taken through to the recovery room. This is usually where you stay for about an hour while you wake up. I was of course already awake and comfortable. Blood pressure and SATS (were monitored but I was fine, if leaky. Indeed I had a long chat to one of the nurses about his back pain and drumming technique. As soon as someone hears you are a physio they want to talk to you about their aches and pains, even when you are in the recovery room after surgery! I returned on the bed to the room. This is standard procedure from any operation as you are likely to be unsteady. You have already been given a sip or two of water and are usually waking up. The process to prove your fitness is to have a drink, then have some food and then go, with a nurse to help get you up, to the loo. You are left to your own devices in the loo itself! I chose a panini as I was not going to be able to fiddle about with cutlery. I am left handed so dexterity was also going to be poor. I was feeling fine although I dozed for a bit. Probably just the stress and some of the whiff the anaesthetist had given me! I had left my phone and tablet within reach and messaged family and got myself going a bit. I watched a little bit of a film. Not a usual occurrence for me but I found it helpful to take my mind off the dead arm. By this time there was function in the fingers and thumb. I could turn my hand palm down, but not back up. I could contract triceps at the back but not biceps at the front. There was a lot of pins and needles and hot and cold feelings. All very odd. I actually found this part, the dead arm, the worst part of the whole process. I am not prone to panic attacks but felt myself getting quite upset about the dead arm. My irrational brain was saying, ‘what if the nerve was permanently damaged?’ I just wanted it to move and it not responding was really hard. However, my logical brain says this is fine, it is normal and it will come back. I know it takes 12-24 hours and this had only been 6 at most. I had to fight the panic feelings though. 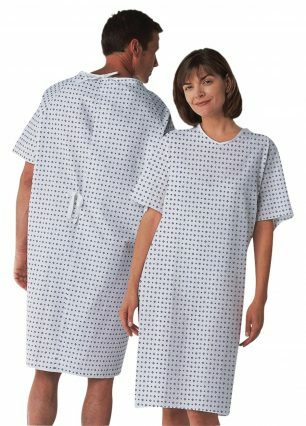 By 7 pm I had got myself dressed and the nurse had changed the dressings. I had leaked quite a bit but had stopped by now. The arm as still useless but not painful. Alastair came around and we briefly chatted about the op and the rehab but the main thing was that we had found more than enough to explain the symptoms I had been struggling with and that the surgical procedures were in fact necessary. It was not getting better without it. I came home with my wife that night and felt fine if sore. I certainly could not drive and was not planning on doing so for at least 2 weeks. The shoulder was not painful afterwards and I slept well that night. The arm needed to be propped on a pillow whilst on my back or under the armpit when on my side. It does ache and the nerve returning does give you strange feelings for a few days. However, the feeling and function in the hand does come back although the arm is in a sling, needing to be rested. The 4 wounds are covered with steristrips and need to be kept clean. The wounds do leak a bit given the amount of fluid that was pumped through the joint. It is swollen and bruised and there are bruises down the arm from the traction that is needed to be placed on the joint to open it up during surgery. 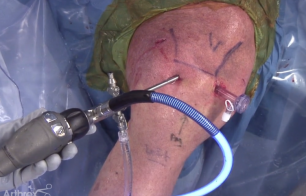 These are inevitable as there is little space available in the joint for manoeuvring during surgery. Keep it still and rested for the first week. Ice it 4-6 times a day. I used a combination of simple ice packs and an Aircast Cryocuff. This is to reduce swelling and pain. Not that it was too bad for me and I used only paracetamol a few times a day. Passive motion only after the first week. Flexion no more than 120, abduction no more than 90, external rotation, ideally to end of the range of motion. The shoulder has a great record of getting stiff and stuck, particularly when it is inflamed, which this clearly was after Alistairs efforts! The best way to stop this is to keep the joint range going without overdoing it. The important range to have is external rotation which is one of the first ranges to be lost. I got this back within the first 5 days. I did not push into pain but eased my way gently. By the end of the first week, I was achieving the ranges set so I was happy. 4 weeks no active movement, not even simple isometrics or holds. The reason is that the tendon has to begin healing. There is a lot of research into loading tendons to make them heal, but that is in chronic conditions. This was an acute repair with inflammation and the whole healing cascade that follows from that. I want the healing to occur, the fibres to knit and the tendon to bind to the bone. This is a delicate process and one which you really only get one go at properly. I was not going to mess that up, so, I was good and kept it in the sling. Once the initial knit has occurred then you can start to load it. The bone also has to be given the time to heal. This is the bone which was cut away from under the acromion and has to be treated like a fracture. It will take 6 weeks to heal and 9 months to consolidate. What I don’t want to do is to stress across that healing surface because there is the chance that it will heal thicker as a result. As we cut the bone away to give space this is clearly not what we want to happen. Therefore we need to treat this healing surface with respect and not stress it. this means keeping the arm rested and in a sling for much of the time and not pushing the ranges beyond those stated above. Once we get to the fourth week we will start to bring in active motion and strengthen the rotator cuff muscles but this has to be done in a graded way as there will be considerable weakness. As a Physio, I have essentially a manual job. I have to pull and push people and their limbs. It is likely that the job had caused the stress across the rotator cuff in recent years when trying to use my elbow more than my ageing thumbs! If the operation had been ‘just’ the bone removal, the decompression, then once the 6 weeks of bone healing was up then it would have been simple enough to return to work at that point. However, the tendon repair changes that. It will be only 4-5 weeks before I regain simple active motion of hand behind back, flexion above the head and begin the process of strengthening. At 6 weeks I will only be able to lift light things as part of a controlled rehab process. Thus, my return to work at 6 weeks was not sensible. I was not going to be able to do my job properly, and in doing so I would risk damaging the healing process. If I had a desk job then I would likely be fine. If I drove for a job then I would likely get away from it. Anything involving lifting and carrying, pulling or pushing a 6-week return is too soon. The 4 holes with stars of steristrips around them had stopped leaking. They were clean and not angry or infected so I left them. In fact, it was 12 days before they had peeled away at the edges and I removed them. The wounds had healed well and they came away easily. In the shower, you cannot have the sling on for obvious reasons. I also did not want to get the wounds wet for the first 10 days either. I used the part of the shower that slides up and down to keep the water flow below my shoulder and washed that way. Armpits were interesting, as they go… I used the taps to hold and moved so I abducted the left arm to allow access to the left armpit with the right hand. Reaching with the left hand to the right armpit was actually tougher. Without the sling on and in the first few days, the arm feels like it is going to fall off. I used the biceps a lot to clamp the arm into my side and worked it that way. Biceps has a tendon that goes across the shoulder and attaches to the shoulder blade so using biceps will hold the shoulder together when the rotator cuff is not happy! It is a similar process with deodorant. I used the sink to passively abduct the arm away from my body, not using the muscles, to open the armpit. Holding the sink I moved my body away from the sink while relaxing the arm. I appear to have also grown a beard. I did not want to risk using my right hand to shave so left it. Oddly I don’t now want to shave so will see how I get on with a beard. First time ever! Probably the most difficult thing. The benefit is that you have time so you work out ways of moving which do not stress the shoulder. Loose shirts are the simplest to start with. I also developed a lot of affection for the cardigan! A much-maligned garment in my view! NIce and simple to put on, left arm forts into the sleeve and throw it around. Useful pockets for phone and gubbins! What is not to like!